Strathcona Toyota Midget A Tyees lost 2-1 against Powell River on Saturday afternoon. 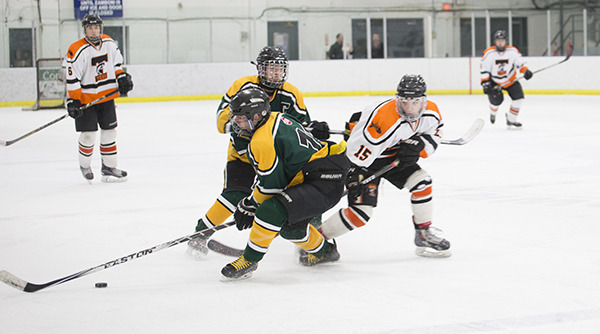 Owen Boyd advances the puck in the Midget A Tyees game against Powell River on Saturday afternoon. Strathcona Toyota Midget A Tyees lost 2-1 against Powell River on Saturday afternoon. Goalie Antoine Minfray saved 27 shots. Jacob Hartley put the Tyees only goal in the net assisted by Doug Campbell and Ethan Mainprize. Ben Regier reaches after the puck. The Nootka Marine Adventures Pee Wee B Tyees wait patiently for their turn on the ice as the Midget A boys play at the Rod Brind’Amour on Saturday afternoon.